With the Breaker ID, you don’t have to shut off power to the entire house, or go through trial-and-error, accidentally shutting off things you don’t want to. A vital tool for both homeowners and contractors, the Breaker ID finds the right circuit breaker every time. 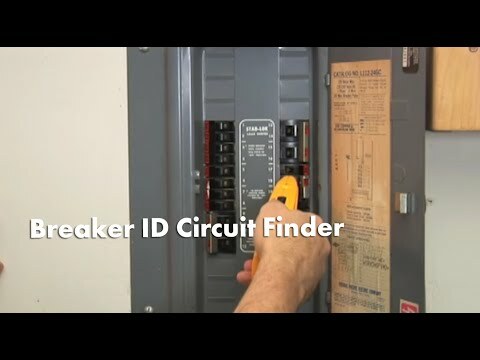 The Breaker ID has two parts: a Transmitter that plugs into a circuit via a standard outlet, and sends a signal down the wire connecting that circuit, and a Receiver wand which is used to scan the circuit breaker panel. Simply plug the Transmitter into an electrical outlet and then scan your circuit breaker panel twice to identify which breaker operates that outlet. During the first scan, the Breaker ID may indicate more than one breaker as it memorizes each circuit. On the second scan, the Breaker ID will identify the correct circuit breaker with a green LED light and audio tone. NOTE: Do not exceed 120 V AC.